At PAD, we spend a lot of time talking tiny houses (obviously), because we love them and love what they can do for people. But living in a tiny house isn’t for everyone, so it’s important to spend time considering some of the other alternatives to traditional housing that offer similar benefits – more community, less money spent on resources you don’t need, and more time to do what you love. If you’re a big house owner who wants those things, you still have plenty of options if you get creative with your space. 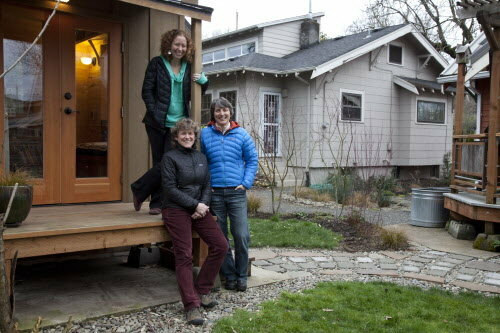 This piece (click over to The Oregonian for the full article) highlights some of the opportunities that housing alternatives like tiny houses offer, even to people who already have a “big house”. Joan references Ross Chapin’s “Pocket Neighborhood” design principles as an inspiration for POD49. These principles lay out clear criteria for how to create a place where “Nearby neighbors can easily know one another, where empty nesters and single householders with far-flung families can find friendship or a helping hand nearby, and where children can have shirttail aunties and uncles just beyond their front gate.” While many of the principles would be best applied at large scales, like multifamily housing developments, just knowing them and keeping them in mind can help individuals and small communities like POD49 achieve some of the same goals and benefits. While Dee Williams is PAD’s resident tiny house dweller and designer, Joan Grimm has a critical perspective as well: a big house dweller who got more than the typical big house experience by thinking differently about her space with her partner, and discovering that a tiny house could be the key to creating a community in their own backyard. The POD49 piece goes along with a separate article just focused on the POD’s Sweet Pea Tiny House and its traveling resident, Gina Bramucci. Gina calls the POD49 tiny house home when she’s in Portland, but also spends time doing relief work internationally. Click over to the Oregonian piece for Gina’s story and a few photos of her beautiful tiny house, and or see and learn more about the Sweet Pea Tiny House and construction plans. Many people interested in tiny houses hope to find or build their own version of POD49, where they can share resources and fun, but also have a door they can close when they need some space to themselves. Both Oregonian pieces combined tell a great companion story about different ways to achieve this same goal. It’s worth considering whether living in a tiny house is going to give you what you want, or if you’re better suited as a tiny house host or mini-community maven. You might even want to share these pieces with the people in your life you’d like to host your house (read more about this in our “How to Find Parking” post). For every Gina, who a tiny house works well for as she sets sail around the world, there’s a Joan, anchoring her with a welcoming, shared space to call home. Posted in Creating Community, Creative Development, Tiny House Parking, Tiny House Stories, Why Tiny Houses?